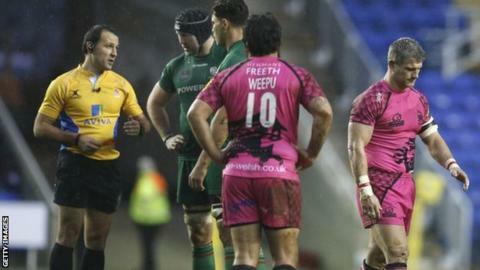 London Welsh captain Tom May and London Irish lock forward Daniel Leo have both been handed one-match bans after being sent off in the Premiership match at the Madejski Stadium on Boxing Day. Leo and May were sent off by referee Greg Garner for fighting in the 34th minute, in a game which Irish won 24-9. Newcastle lock Kane Thompson was also suspended for a week. He pleaded guilty, having been cited after the 25-23 Premiership home defeat by Saracens for striking Jim Hamilton. The trio are all free to return to duty from 6 January onwards. May and Leo also both pleaded guilty following their flashpoint. May lashed out with a swinging elbow and, although Leo initially appeared to be defending himself, having grappled the Welsh centre to the floor, he then struck him with a forearm.